While walking the floor at the Detroit auto show, I caught up with Chrysler design chief/the automotive industry's resident badass Ralph Gilles about what was in designers' heads when approaching the redesigned 200. They found their inspiration in, among several other things, classic Eames lounge chairs. I only had two minutes to chat with Gilles since he was on his way to a prior appointment, so I couldn't ask him about an SRT Dart hatch or what the next Challenger will look like, but he did provide some good insight on the 200. "You can't say it's an entry-level car. "If you just walked up to the vehicle without knowing what brand it was you'd hopefully would guess the price was $20,000 more. That was a formula that was successful with the 300 back in the day," Gilles says. The 200 is obviously rounder than the previous Sebrihundred, something everyone's doing to help boost fuel economy. "The surfacing was all about managing the aerodynamics in a very holistic way. The front, side, back of the car — it never stops," he says. 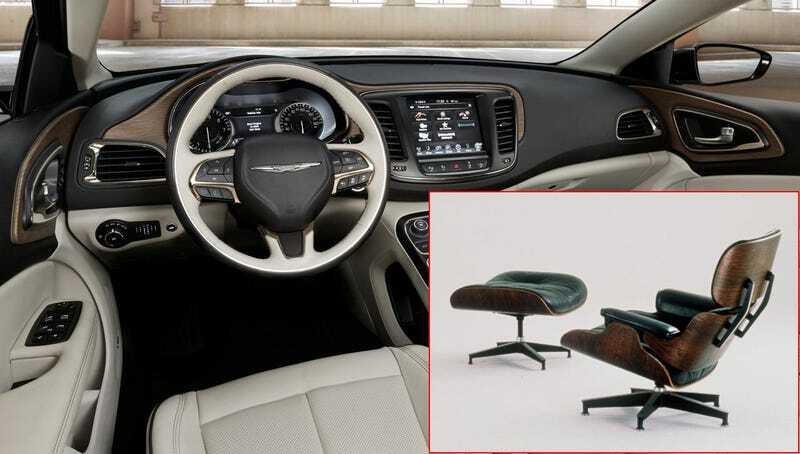 A few years ago, an auto critic described Chrysler interiors as having the same quality as "Chinese water guns," so ever since then, the company has invested more and more into cabin materials. Say what you will about the exterior ("It's a Dart! It's a Fusion! It's an Impala! "), but the inside is smooth. The 200 has three trim levels and there's real wood with each trim level, and not fake woodgrain at the lower levels and real stuff as the price goes up. But for inspiration, Gilles and the Chrysler team turned to classic American design. "The interior was an exercise in restraint and futurism, but at the same time Americana," Gilles says. The wood treatments is where the Eames influence is most evident. "It's a classic American piece that takes wood and simply bends it." Eames' influence is also elsewhere in the car, in the the bezel that holds the door remote and the instrument cluster. "It feels familiar, it feels like it's been around." The 200 might represent the new face of Chrysler, but the boxier 300 might not follow the exact same direction. It'll still stand alone, Gilles says; "It still has a very undeniable presence."